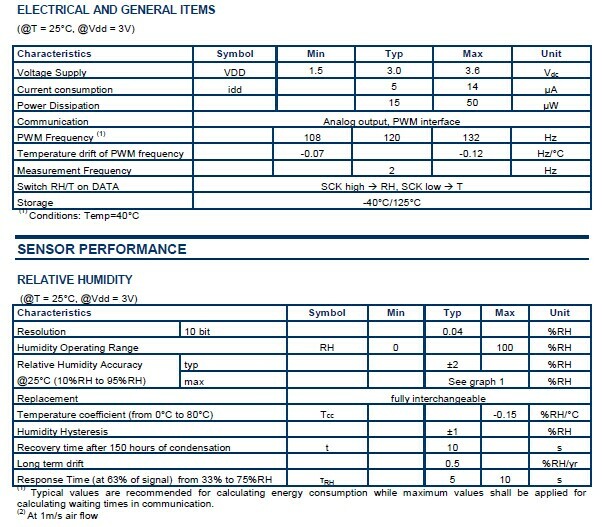 HTU21P(F) is a humidity and temperature sensor. Setting new standards in terms of size and intelligence, it is embedded in a reflow solderable Dual Flat No leads (DFN) package of 3 x 3 x 0.9 mm foot print. This sensor provides calibrated, linearized signals in analog pulse width modulated (PWM) format. 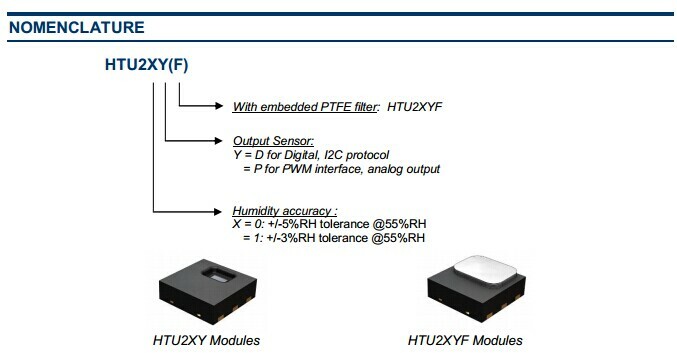 HTU21P(F) humidity sensors are dedicated humidity and temperature plug and play transducers for OEM applications where reliable and accurate measurements are needed. These low power sensors are designed for high volume and cost sensitive applications with tight space constraints. The PWM signal runs on a base frequency of 120Hz, the data signal is provided on SDA line. Pulling SCL high or low allows for switching between humidity and temperature, respectively. The sensor measures twice per second. The PWM signal may be converted to an analog ratiometric interface by adding a low pass filter. With MEAS’ improvements and miniaturization of the sensor, the performance-to-price ratio has been improved – and eventually, any device should benefit from the cutting edge energy saving operation mode. The HTU21 is also available with digital I²C (HTU21D(F)). Optional PTFE filter/membrane (F) protects HTU21P analog humidity sensors against dust and water immersion, as well as against contamination by particles. PTFE filter/membrane preserves a high response time. The white PTFE filter/membrane is directly stuck on the sensor housing.